It’s February now, but I wanted to share one more vegetarian recipe with you. It has been a really great month, I’ve had a lot of fun cooking new recipes. This challenge has really pushed me to try new flavor combinations and ingredients that I may not have otherwise. Probably one of the most valuable things I learned this month was to be more adventurous with flavors and seasoning. I realized that with meat dishes I allowed the meat to take the flavor lead, which doesn’t work when it comes to vegetarian meals. After a week of bland food, I began to become more confident exploring spices, herbs, seasonings, and bolder flavors. So, were we running for the meat counter on February 1st? Not really; we had a honey mustard roast chicken mostly because I’ve been antsy to try the recipe. It was okay, the mustard sauce was really good, but I mostly ate the asparagus we roasted on the side. When I started the challenge I posted a quote from food writer Michael Pollan, “Eat food. Not too much. Mostly plants.”. This perfectly encapsulates how I feel about food. Meat should be a side dish, something to be eaten once in a while in the company of grains, legumes, and vegetables. Even Bon Appetite is getting on board with their flexitarian recipes in the February issue. This January challenge has pushed me to recommit to eating a mostly plant diet. It is healthier for me and healthier for the planet. So, with that, this roasted red pepper and spinach calzone is certainly not lacking in flavor and personally I prefer it served with good friends. With a pre-made pizza dough from Whole Foods, this calzone came together quickly for an impromptu dinner party. Like I said, I used a pre-made pizza crust for these particular calzones. Usually I make my own crust, though lately I’ve been less then impressed with it. If anyone has an easy pizza crust recipe let me know, but the recipe will work with your own favorite or a good-quality pre-made dough. Local pizza places are usually willing to sell their dough for $2-$3. Heat oil in in large skillet, add onions and a pinch of salt. Cook until starting to brown and slightly caramelized, 8-10 minutes. Add garlic and cook until fragrant, about a minute. 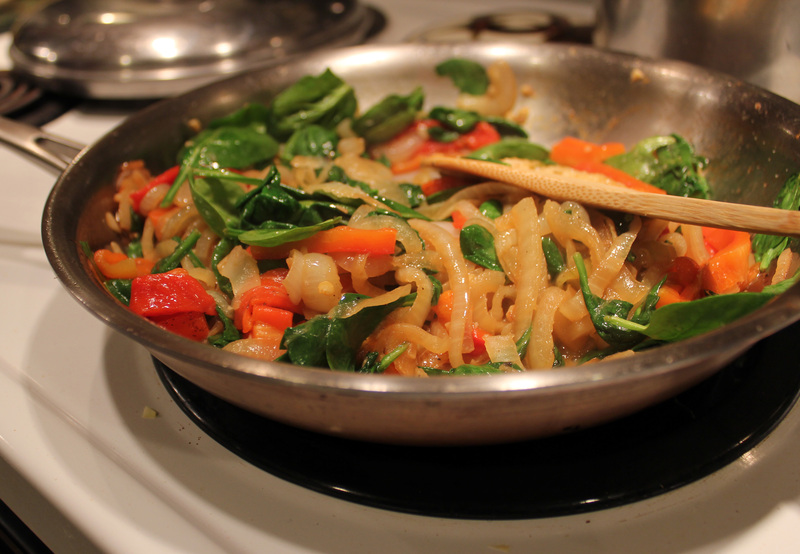 Add spinach to pan, stirring frequently and cook down until wilted. Add red peppers and stir to mix. Add splash of wine and allow to cook off. Season with nutmeg, salt, and pepper. Divide dough into fourth and roll out each ball into a 6-10 inch round. Sprinkle cooking sheet with cornmeal and place rounds on sheet. 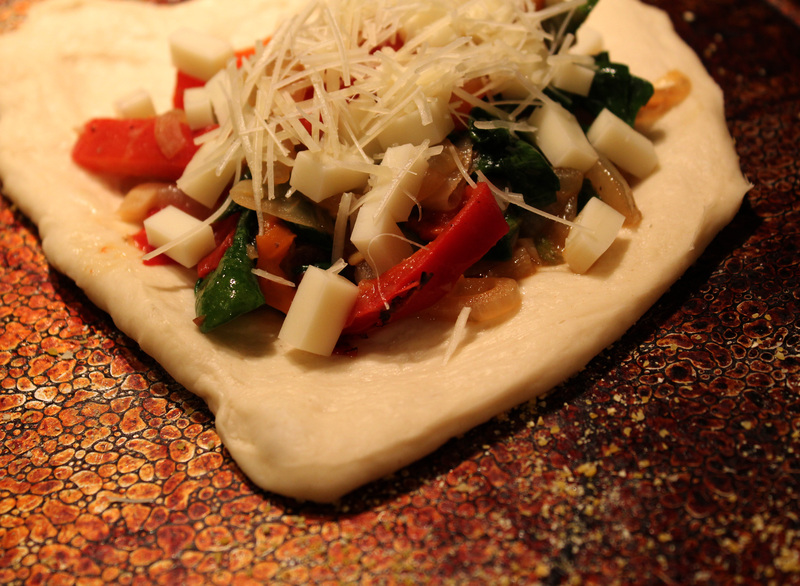 Add a quarter of the filling to the lower half of the dough along with a quarter of the cheese. Fold dough in half over the filling and roll edges to seal. Using a sharp knife slice small air vents on the top of the calzone. Repeat with remaining dough. Cook calzones in preheated oven for 10-15 minutes, until the dough is golden brown and the cheese is bubbling. Allow to cool slightly before serving. This entry was posted in Food Revolution, Quick dinner, sustainability, Vegetarian and tagged quick-dinner, Recipe, Vegetarian. Bookmark the permalink.